I regularly visit the outdoors markets in Paris to do my shopping. It’s a lot nicer than the supermarket and I’ve gotten to know many of the vendors personally. Last Friday I took a lovely journalist from Poland through the market, who was writing a story about me and my new book. And I thought I’d be fun to take her shopping with me. She asked me a lot of questions as I blazed through the market, where I dialed in on the fresh figs immediately. Worried that the fragile beauties would get smushed in my bag, I made a mental note to go back and get some. The best market tip I can give is to see what everyone has, then go back, and get what you want. But another is not to go with any expectations, because what might be available in abundance one day, will (invariably) be gone a few days later when you go back to get it. So I stock up when I see things things, like the ripe ‘n ready black figs, shown up above. The ones that were syrupy and sticky-soft got eaten fresh, right away. A few others were roasted in the oven with some white wine, honey, and a few branches of fresh thyme. I also bought a magnificent head of lettuce, since I eat a lot of salads. 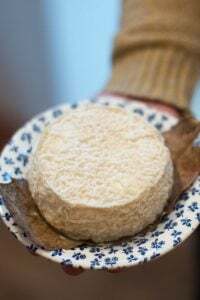 And even though I had plenty of cheese at home – as usual – while introducing her the women who sell the stellar cheeses that I’m fortunate to have so close by, I was powerless to resist the artisanal goat cheeses, each wrapped in a chestnut leaf. And into my basket one of those went. She asked me about root vegetables, which are having a renaissance in France, so I took her to the stand that specializes in les légumes racines. I’d gotten bear’s garlic from that vendor last year (and, of course, when I went to get more a few days later, it was nowhere to be seen), and while perusing her colorful radishes and beets, I noticed a basket holding tresses of ail fumé, or smoked garlic. 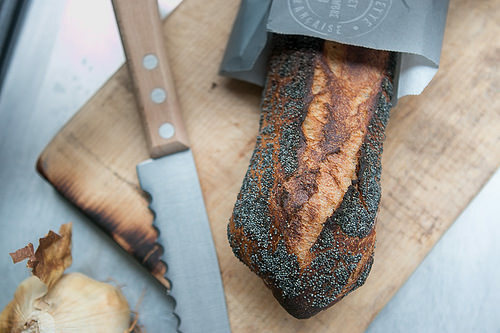 Parisians aren’t know for the abundant use of smoky flavors. So it’s a little surprising to see smoked garlic at the markets. This specimen that came home with me hailed from the north of France and a little research led to me learn that they’re Ail fumé d’Arleux, which have been in production for over four hundred years. Smoking was originally a way to preserve the garlic. Before refrigeration, people would store foods in their chimneys (including cheese), which would help preserve it, as well as lend a smoky taste. So why not garlic? The most notable dish using smoked garlic is soupe à l’ail d’Arleux; a simple soup of smoked garlic, potatoes, carrots, and thyme, sometimes topped with grated cheese or crème fraîche – you can find some recipes here and here, in English. I didn’t make soup, although it’s on the roster for this winter. 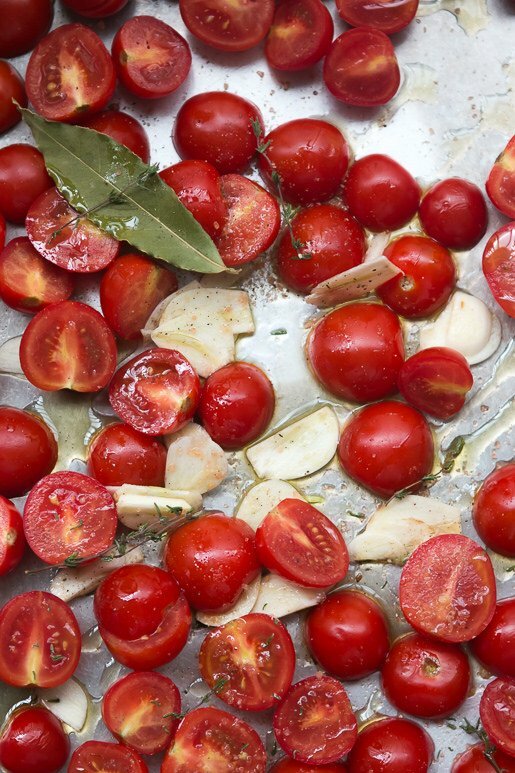 Instead, being très Parisien, I had picked up some cherry tomatoes and decided to give them a good oven-roasting (using the recipe in My Paris Kitchen), along with a generous amount of smoked garlic. 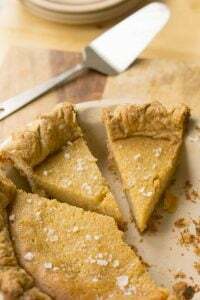 I piled them on a baked tart shell (from dough that I found that had been languishing in the freezer, which got a bit dinged up on the walk to their place), that I topped with a slather of fresh goat cheese (recipe also in the book). Since I was going to a lunch where one guest was a vegetarian, it made a fine main course, finished off with a scattering of flat-leaf parsley and rosemary oil. A few others cloves got scraped over some leftover baguette slices, that I’d brushed with olive oil and toasted in the oven. 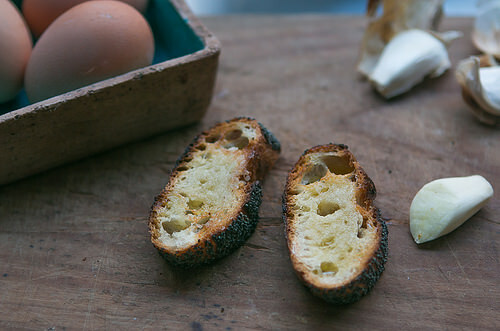 As soon as they came out and were cool enough to handle, I scratched the garlic over the oily surface of the bread, that released that heady garlic fragrance, and we ate them with wild mushroom omelets the next day for supper. And people ask me why I live in France? Another curiosity from the market that I picked up last week were navets amèrs, sold the friendly guys from North Africa, who have taken to me, l’américain, who always asks them about whatever curiosities and oddities they have on display. (That, usually, everyone else is ignoring.) But another tip if you go to markets in Paris is to take the time to talk to the vendors. (And being Paris, you can ignore those people lined up behind you.) Most are happy to tell you about their fruits and vegetables, and how to use them. And even madame, pushing her shopping cart into you from behind, nudging you forward, might also chime in with some pearls of wisdom as well. 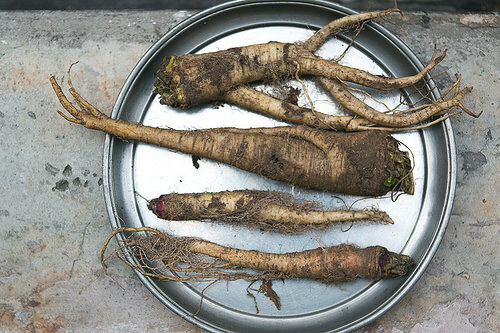 The name means “bitter turnip,” but as they sat on my counter at home, I started thinking that they might actually be ginseng — and since I paid about 75 centimes for them, that would have been the deal of the century. When I’d asked the fellows what to do with them, the guys were rapturous, explaining how you just trim them, slice ’em up, and eat them raw. Um, okay. When I got home, I looked them up online and found a recipe for mutton tagine with bitter turnips, which sounded a little more appealing than the one I saw for tripe with bitter turnips, which didn’t say to peel them. Stomach lining and dirt? Not my kind of dinner. Unfazed by the hairy roots, I took the advice of the guys are the market and carefully peeled one, digging deeply with my paring knife, since the skin was thick and there was some deep veining in there. I sliced a few rounds and took a taste – and found them absolutely delicious. 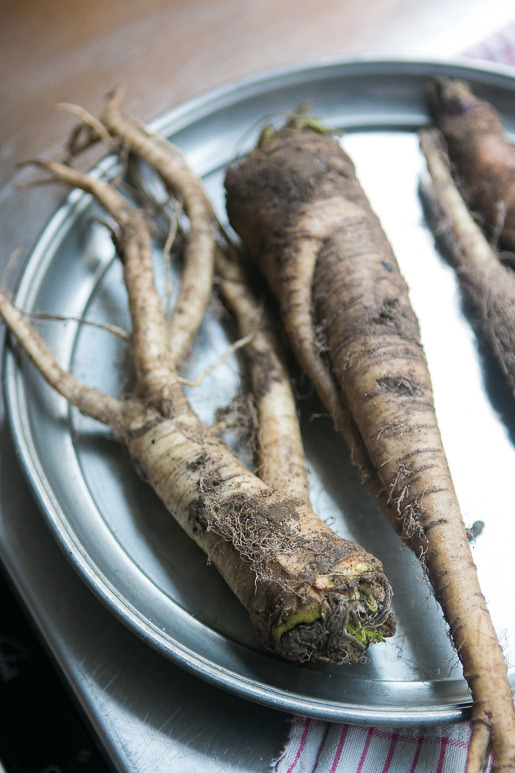 They had a slight horseradish flavor, and I could absolutely see using them in my next tagine, or even roasted up with a mound of other winter vegetables when the weather gets cooler. Although I think I’ll leave the tripe at the market. Oh, those figs! The bread! The smoky garlic! 8:45 in the morning in Texas and I’m drooling. What I would give to have smell/taste-o-vision on my laptop! But second that glorious bread and roasted garlic! Another plus is that you usually cannot haggle or get a deal at supermarkets. What a wonderful experience at a Paris market! 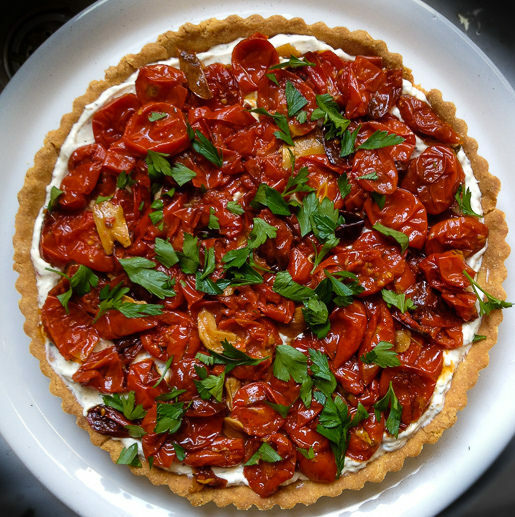 The tomato tart sounds fabulous. 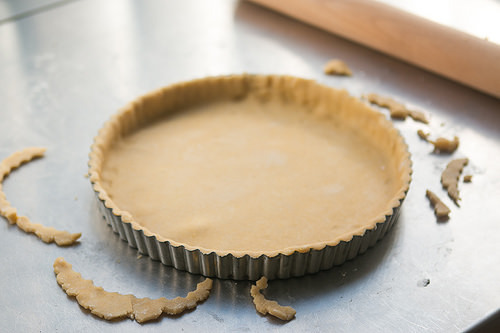 I have a thing for roasted garlick so the tart fills my heart with joy. As for tripe, I do a very spicy tripe and it’s extremely popular around my friends. If you do it right, tripe can be delicious actually. 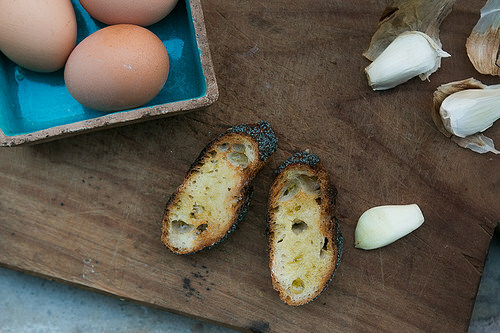 I’ve always been fascinated by smoked garlic recipes, but have never found some to actually try. Lucky for you, to just chance upon it! Also from my experience at Middle Eastern outdoor souks, I ALWAYS trust the vendors on their recommendations, no matter how strange they sound. They’re truly the experts on their products! 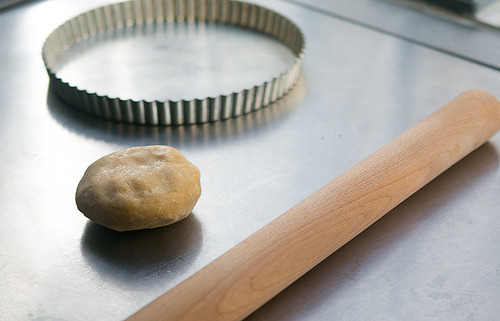 On the flipside, I tend to get immediately distrustful when I ask for advice on a certain product and the vendor tells me they don’t cook with it…. that TART! gorgeous perfect gorgeous perfect! I just roasted some last of the season tomatoes yesterday, got some tart dough in the freezer and goat cheese in the fridge. Making that now. Thank you. Compliments first. I look forward to your e-mails and relish your humor, photographs, and recipes. Sometimes just reading a recipe is satisfying. What prompted me to write you is my surprise at your reaction to tripe. Have you ever tried Philadelphia Pepper Pot Soup? My recipe came from Craig Claiborne’s “An Herb and Spice Cookbook” from 1963. Hearty and warming on a cool winter day. 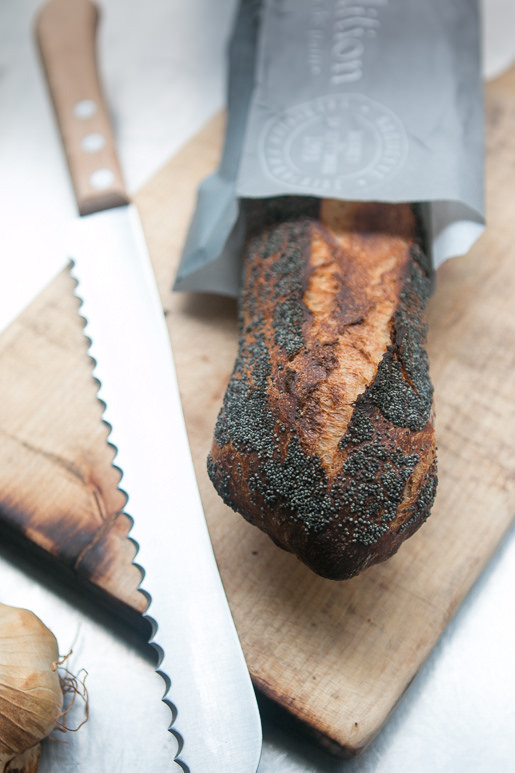 I always say that I don’t really like smoked foods – I am certainly not fond of smoked cheese, and do prefer unsmoked bacon and ham – with the exception of smoked fish. 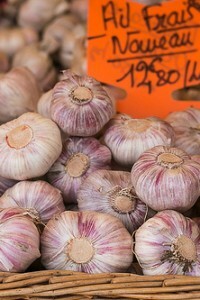 And, indeed, smoked garlic, which one cannot get here, but which I occasionally buy when in France, just to make a change. 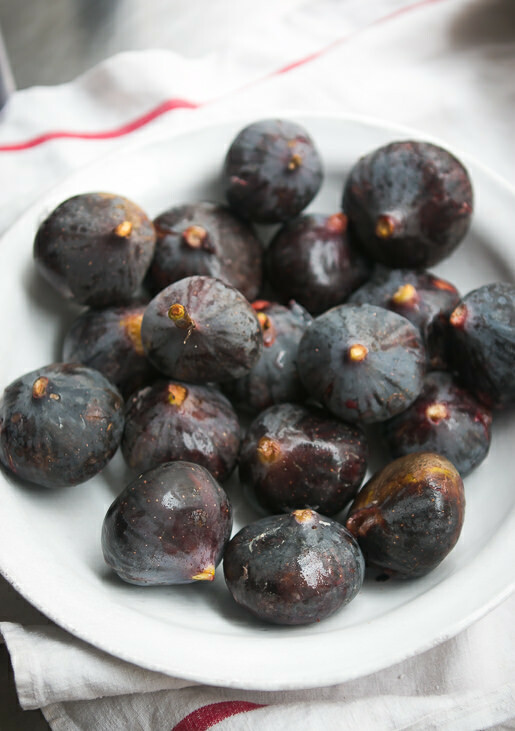 Those figs look to die for – I’ve only found affordable ones once this year, and they were lovely. My parents have a fig tree in their front yard, and although it doesn’t produce every year, those years it does – well, have you ever picked a fig and eaten it standing beside the tree? 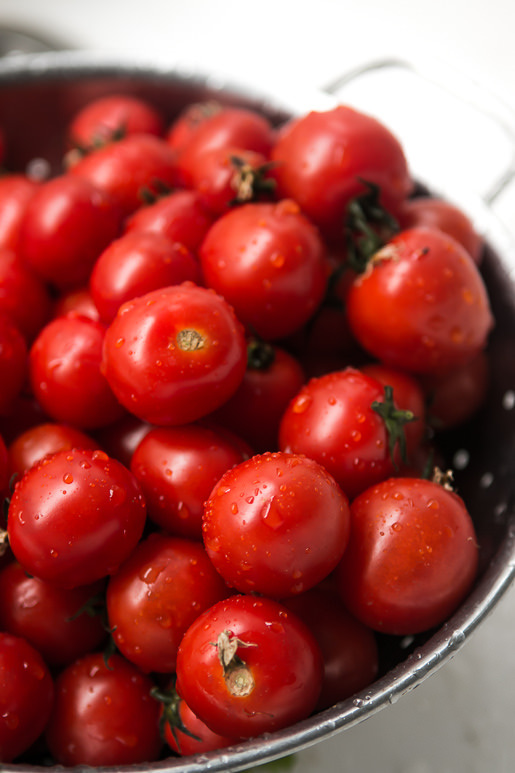 It’s like when you pick a tomato and eat it standing by the vines…. best in the world! You’re looking in the wrong places Annabel, I bought some at Newbury Show only a couple of weeks ago. There are some really good British garlic producers who tour all the foodie shows, but have websites and do mail-order as well. When I bought mine, the chap that was selling it told me that the question he got asked most about smoked garlic was whether it grew like that! Wonderful post–thank you! I’ve added ail fumé and navets amèrs to next weeks market list. I hope I’m able to find them. I love reports like this that familiarize us with lesser-known produce, and give ideas of what to do with it. Stomach lining and dirt? Save it for when Anthony Bourdain comes over for dinner. I would love to know more about all the kinds of garlic here. it’s daunting. I know the Sud-Ouest pinkish one though not much about it’s flavor. Paris markets are a goldmine of flavors and information. Always uplifting to visit even if I have nothing on my list. I love your site and getting your newsletters. You are a very funny guy! Wish I was strolling through the Paris market and could run into you. How I miss Paris!! My best treat is waking up and sitting down with a cup of coffee to read your wonderful newsletters. And, oh the recipes! 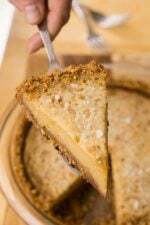 Your tart in the posting today is beautiful! 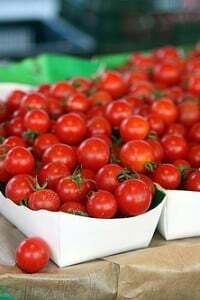 I live in North Carolina in a farming area and there are several good farmers markets near by. I love talking to the vendors and have found that some of them love to cook ask much as I do. It is really exciting to plan my week around some of their wonderful organic produce. Thank you! Thank you! Please keep posting and maybe we will meet some day when you are on a book tour. I found some massive black radishes the other day here in Germany. Do you have those in France? Apparently they are as hot as hell. What is with that beautiful bread? Looks like poppy seeds on the outside. How about a few words on this loaf? 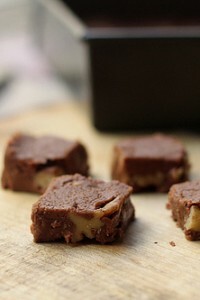 Love the photos – absolutely delicious! Do you know if bitter turnips are related to burdock root? They look very similar! I am so hungry after every post! All of this looks lovely, and the adventure of the market is so tantalizing. I am always hungry and envious, so perhaps your blog is one I shouldn’t read if I am trying to improve my character! Thank you for the education about things I would otherwise never know. Viva l’américain in Paris!! You captured me with those royal cloaks of purple prizes! Wish I had some in my nest now. Happy Nesting. Wow! Lucky journalist! Your market haul sounds like a dream. Thanks for sharing your adventurous spirit in and out of the kitchen! 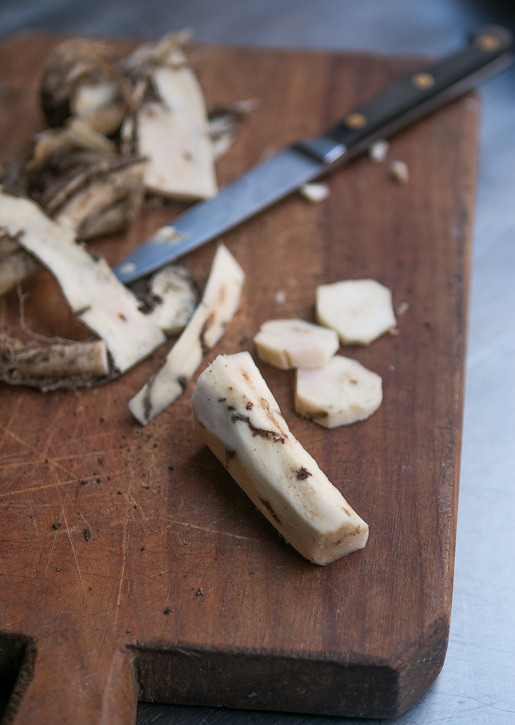 We have a fantastic local artisan producer of smoked garlic here in New Zealand. 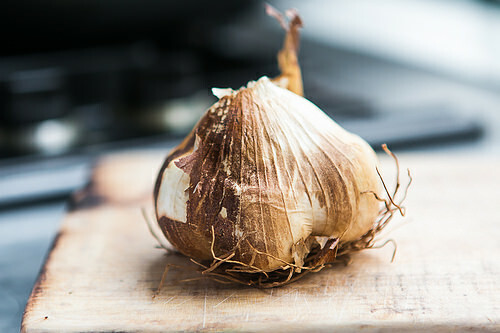 I love the flavour, but found it didn’t keep they way ordinary garlic does, so I needed to use it quickly. Supermarkets are one of the few non-magical places in Paris. When I lived there I always preferred the outdoor markets and the small specialty shops. As a botany weirdo, I wanted to know more about the difference between turnips and bitter turnips so I googled, but haven’t found much info. is there an English name for the navets amèrs? I image searched too, (turnips have traditionally been important in scandinavian cooking), but didn’t get far with the bitterness part. Do they taste like bitter gourds? beautiful. i am jealous of your polish friend – a tour of a paris market with david lebovitz? yes please! i am usually a fan of bitter, coffee, molasses, dark chocolate, etc. but more fearful of it in vegetables. i think i could try these though, on your recommendation. The bitter turnip looks awfully like my oyster plant. The smoked garlic sounds yummy but not much chance of getting it in this neck of the woods [deep south – Tasmania]. Jill: Usually oyster plants (salsify) have a dark, smooth exterior. I like those a lot, too – and they’re somewhat hard to come by here as well so I don’t buy them as much. 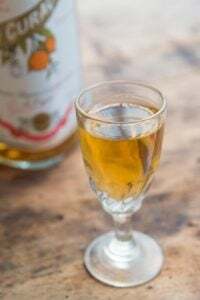 Jessica + Rosemary: When putting the post together, I did a quick search for a botanical/Latin name, but didn’t want to get it wrong (and was running out of time), so I didn’t find it. Likely they are not actual turnips but related to horseradish? But that’s my best guess, based on the flavor. Sara: Unfortunately supermarkets in France tend to me soulless places. I think it’s because France was previously a place of small businesses, and face-to-face contact. And that same “spirit” isn’t there, in the supermarkets. 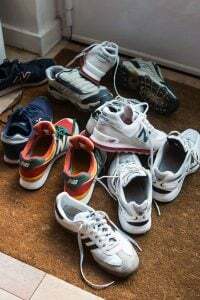 Plus checkers and people who work in them are usually in a sour mood and not friendly, and customers don’t treat them all that well either, which doesn’t make for a pleasant place to shop. I try to avoid them but I need to go from time-to-time. I did some further research (it wouldn’t be me if I hadn’t ;) ), and haven’t been able to find anything more detailed so I’ll settle it for being a plant conumdrum for the time being. They do look horse radishy, and look to be quite prominent in North African cooking. There’s an interesting, somewhat encyclopedic (lets face it, you can’t cover every food plant in a book unless you plan on delivering a single copy on a truck), book on food plants; Food Plants of the World. Has information on plants randing from regular peppers, to raspberries, to paw paws, to sour figs. your bitter turnip looks just like the horseradish they sell here in israel for passover, which when grated can be very potent. Thank you for another wonderful post about the markets in Paris. 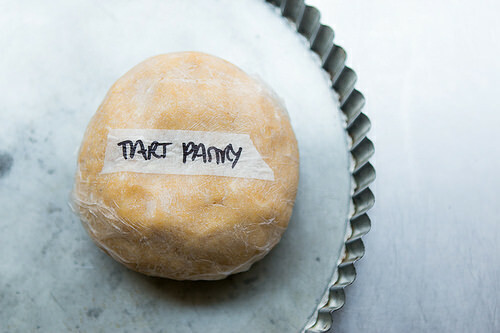 It’s always a joy to read your blog and to make yummy sweet things based on your receipts. Thanks for the trip to the market David. I love to visit them when I come to Paris and have been to many. Can you tell us which one this is? I do try to talk to the market folks, know a wonderful cheese guy at Monge Market and will always remember the flirty olive sellter at Saxe-Breteuil. My tress of garlic remained fresh at least half a year without getting the little green sprout inside. 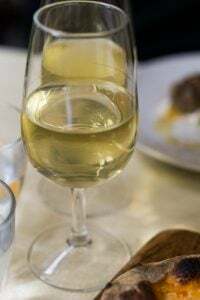 And what a wonderful, aromatic and absolutely delicate taste it has! Am now intrigued by the bitter turnip. Is it close to a daikon? Wonder if it’s just a wild turnip. Turnips are known for being naturally a little spicy and bitter – farmers are always trying to sweeten their turnips and US recipes are all about removing the bitterness…maybe that’s just their nature when untampered with? This is reference to a older recipe 7/2011 “Green tomato chutney” As with many folks out there with gardens, there is usually an abundance of green tomato left in September and even October. 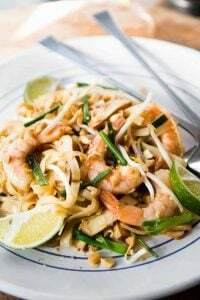 I found your recipe on line and almost didn’t make it because you have never been so lack luster about any of your recipes before. Denigrating the textures of green tomatoes, your general disinterest in it as an ingredient, so non committal, I could practically hear you yawning as you say, try it if you don’t have anything better to do like your taxes! Well people, make this recipe! It is wonderful. Green tomatoes when cut are crisp and glistening, green tomatoes come at the same time when one might have many peppers left in their garden as well. I used two hot peppers diced instead of dried. I love the heat and contrast of hot, tart and sweet. Great with roasted pork, or on a crisp bread over marscarpone cheese. Love it! David you should re- post the recipe. Dear David, I completely agree with Deborah, this is horseradish, can be eaten shaved with a tiny drop of vinegar, or mixed with beetroot to dilute the bitterness or the kick, as they serve in all the Jewish deli’s world wide. It even tastes great with fried kreploch – yum yum, I am getting hungry! It seems like this is called “left mahfour” or “léfte mrar” in French – those spellings seem to be various translations from Arabic. (I saw various websites that spelled it “left” or “llaft.”) In French, horseradish is raifort and I’m sure there is some relation, or perhaps it’s a variety of horseradish (like you mentioned) and not a turnip. Interested they serve these with vinegar. I could not eat raw horseradish if cut into batons, but this I could. I tried to find the Latin name and couldn’t. But it’d be interesting to know the actual story. Thanks for chiming in! Plants do, invariably, intermingle, and you’ll get a nice crossed variant, which then someone has the great idea of cooking into something wonderful :). Checkout Horseradish and beetroot recipe. It was an Eastern European dish originally. Also, my grandmother, who was Lebanese, used to stew lamb tripe with beans and tomato, almost like a cassoulet, and it was absolutely delicious. She preferred it to beef tripe, said it was more delicate in flavor. I didn’t know about your blog or wonderful books till recently, what a joy to find! Really makes my day, so hang in there, even though it is a great deal of effort for you, you brighten the kitchen for many of us travel- starved home cooks!